Harry Mattison has posted a series of comments of residents from the DPIR phase of public comments. The BRA should not waive further review of the project. Official information on the Science Complex can be found at Harvard's Allston website. More extensive information, including public comments and analysis, can be found at Mattison's HarvardInAllston website. I watch very little television, but rarely miss catching "Beat the Press" -- the Friday edition of WGBH's "Greater Boston" -- at some point over the weekend via Comcast On Demand. During one of the segments of the September 28, 2007 broadcast, the panel slid back-and-forth between Oklahoma State football... and Boston College football. Host: Emily Rooney. Guests: Dan Kennedy (Northeastern University), Eileen McNamara (Brandeis University, formerly of Boston Globe), John Carroll (Boston University and Greater Boston), Joe Sciacca (Boston Herald). The video of the segment can be viewed online here. The show was doing a segment on the press conference by Mike Gundy, coach of the Oklahmoma State University football team, who was complaining about a column by sportswriter Jenni Carlson. Her column was critical of OSU quarterback Bobby Reid, whom Gundy sidelined recently. The gist of the discussion was that the column was journalistically not well-written -- if not even "toxic" in Carroll's mind -- but also that Gundy's outburst went off the deep end. There was some degree of disagreement amongst the host and guests about whether or not sportswriters should treat college athletes at big-time football programs differently from professional athletes: the segment had an on-air interview by Boston Globe sports columnist Dan Shaunessy who said that they should be treated differently, while acknowedging, however, that it was a bit of a gray area; Joe Sciacca made the point, and Dan Kennedy agreed, that these college athletes are part of a big-time money-making machine, receive big scholarships and premium housing, and are one-step away from professional sports, and hence should be treated with a scrutiny similar to professional athletes. Apparently, Reid's mother is considering a lawsuit against Carlson. MCNAMARA: A kid who is playing hockey for Williams College is not the same as somebody who is playing Big 10 or Big 12 football. I know absolutely nothing about sports, but I am married to a sportswriter, and he says this is big-time athletics... We don't comprehend it, really, here in New England, what real big-time college sports is. KENNEDY [overlapping with Carroll]: It's as big as professional sports in much of the country. CARROLL [overlapping with Kennedy]: We're going to get a lot of email from BC fans out there... sorry, Dan. ROONEY: I'm talking about the game itself. KENNEDY: You don't get it here, because we have major professional sports in every sport you can think of. But if you go out into fly-over country like Oklahoma, this is it, this is what life revolves around, their big-time college sports program. And these guys, it's one degree of separation between that and the NFL. I have a prediction: they are about to receive a lot of letters and/or email from BC fans. Comments? Direct them to greaterboston@wgbh.org . Once again, comments or complaints about the WGBH broadcast should be directed to greaterboston@wgbh.org, not here. I suspect that Carroll was making a reference to Boston College athletes who have had some legal (and behavioral) problems both recently and in the more distant past. He gave no specifics, particularly since his comments were in passing, but a little bit of research provides some details. "Teammate Andrew Bryant was subsequently dismissed from the university after news broke of his involvement in a robbery during which he pistol-whipped somebody. The next year, a bizarre story broke concerning Jermaine Watson jumping out a window, rumored to be armed and escaping cops. He jeopardized his playing ability to escape legal authorities." Hockey isn't immune: "Captain and assistant captain Joe Rooney and Brian Boyle were stripped of their respective C and A jersey patches." [See note below for clarification: punishment stopped there.] Woman's hockey coach Tom Mutch "stepped down [in April] in the wake of allegations of improper behavior with one of his players" (Boston Globe) -- sexually explicit text messages to Mutch were found on one of his player's cell phone, according to The Heights. Mutch is married, by the way, to a woman who isn't on the team. This summer, two BC football players, Gosder Cherilus and DeJuan Tribble, were involved in a bar scuffle that has led to charges filed against both. I believe that both are currently playing for BC football this fall. And former linebacker Raymond Henderson was recently, allegedly caught with three different drugs and trafficking paraphernalia in his Cleveland Circle apartment, and has been indicted. Boston College is a Jesuit-led university that focuses on "student formation," i.e., in teaching their students how to be moral and upstanding in every aspect of their life. It is a fair question to ask: why does this focus on "student formation" appear to be finding difficulty gaining traction amongst a few of their student athletes -- and even one of their coaches? Note: comments to the Brighton Centered Blog are encouraged, but moderated. Vitriolic comments will not be published. EDIT (10/2/07): The case of BC football players Tribble and Cherilus just got more complicated: the man injured in the bar fight, Sean Maney of Watertown, has now also been charged with assault and battery. This means that pretty much everyone involved in the scuffle (except Maney's brother's girlfriend) has been criminally charged -- Tribble, Cherilus, off-duty state police officer Joseph Boike, and now Maney. Reports of the after-election event for the Tim Schofield campaign were that, as the returns started coming in, the mood turned to "dejected", stunned, or somber. His supporters were expecting a much better result than a distant third in Tuesday's preliminary municipal election. It is fairly clear that Mark Ciommo campaign had an effective get-out-the-vote effort on election day, resulting in a first-place finish. Inspection of the results for Greg Glennon show that a strong majority of the Russian Jewish senior bloc voted for him -- as did the more general senior vote in the neighboring precinct -- leading to his second-place showing. But what led to the defeat of Schofield's effort in which he missed second place by nearly 300 votes? There are two answers, in order of decreasing likelihood: (1) Failure to get-out-the-vote in what should have been his strongholds of Ward 21, particularly along Commonwealth Avenue; and (2) a split in the institutional expansion vote, particularly due to the participation of fifth-place finisher Alex Selvig. The analysis here is based on the unofficial returns by precinct that I recently posted. There is little question that seniors voted heavily for Glennon in this election. Wallingford Road's Ward 21, Precinct 13 went 303-142-57 for Glennon-Ciommo-Schofield. It wasn't a voting bloc per se, but instead the Russian Jewish senior vote broke well but not overwhelmingly for Glennon at 56%, indicating that there was no formal endorsement for any one candidate by ward boss Naakh Visoky. Compare with November 8, 2005, when incumbent Councilor Jerry McDermott carried 80% of the precinct at 507-114 against Paul Creighton -- that was a voting bloc. But far more interesting was the senior-heavy, but not so overtly Russian, neighboring Precinct 12 in Ward 21, which includes other senior housing buildings like Covenant House. This precinct sailed into Glennon's hands 147-75 over Ciommo, which is surprising considering Ciommo's connections with seniors at his job as Executive Director of the Veronica Smith Senior Center. 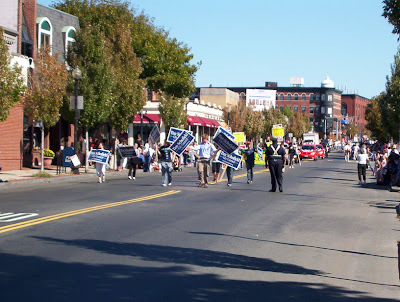 In 2005, the precinct went only 55%-44% for McDermott, even though McDermott had the endorsed bloc over on Wallingford Road, indicating how those two precinct votes do not always follow each other. Glennon's victory in 21/12 threw another more than 100 votes to him relative to Schofield. I'm sure Glennon will be able to read the writing on the walls: he won a place in the finals by gaining 372 votes over Schofield from these two precincts. He's got some helpers to thank. Ciommo was expected to do well with seniors district-wide, but that is more difficult to assess based on the precinct-level results and the lack of an exit poll. After seeing the 303 and 147 Glennon votes in those two precincts, the next biggest thing that stands out in the precinct results is the horrendously low voter turnout in all of the rest of Ward 21. Nine of those other 12 precincts had voter turnout of 1.6 to 5.5%. Yes, you saw that correctly, Ward 21, Precinct 8 had only 1.6% of registered voters show up at the polls, compared to a district-wide average of 12.5%! If you ignore the two senior-heavy precincts, Ward 21 is generally known to be more progressive than its neighboring Irish Catholic Ward 22 to the west; Ward 21 should have been part of the Schofield base. Schofield did, in fact, win six of the Ward 21 precincts, but did so by getting only 12 to 20 votes in each of those six precincts. The same six precincts had 9-16% voter turnout in the municipal election of November 2005, disproportionately higher relative to the overall turnout rates. All six precincts together could barely make up the ground Glennon gained in 21/12 alone, and were nowhere close to Glennon's relative gain in 21/13. There is one little nugget that Schofield's campaign should enjoy: he was the only candidate to get votes in the double digits (i.e., at least ten) in each and every one of the 27 precincts. Ciommo, Glennon, and Rosie Hanlon managed ten or more votes each in 20 precincts; Selvig did it in ten precincts. Schofield can take heart that he saw some broad support across the district. Schofield were only separated by two votes, keeping Schofield from making up ground lost on the senior vote. The issue of institutional expansion gave rise to Selvig's candidacy, but also was a significant factor for Hanlon and Schofield -- long-time and three-month members, respectively, of the Boston College Task Force. First-time candidate Selvig carried nearly 300 votes, and they really did come from the neighborhoods adjacent to Boston College's Brighton Campus and Harvard University's Allston Campus. Selvig picked up 23% of all of his votes carrying his home Precinct 8 in Ward 22, north and west of the land formerly owned by St. John's Seminary. The other precincts he carried at least ten votes were nearly all either adjacent to 22/8 (i.e., precincts 3, 4, 9, and 10) or in the heart of Harvard's Allston country in Ward 22, Precincts 1 and 2; but in the Harvard area, he got beaten soundly by all four other candidates. In short, he carried the BC vote (barely), but Ciommo and Schofield took the Harvard vote. Overall, Ciommo edged Schofield out on the institutional expansion precincts, contrary to my prediction. The people who stop by Brighton Centered are typically interested and involved in the institutional expansion issue. And they broke for Schofield, followed by Selvig, in that failed poll in July. Could Selvig and Hanlon, who were both active in the issue before the campaign, have driven enough institutional expansion votes away from Schofield to bump him out of second place? Quite possibly, although difficult to prove. I suspect most supporters liked Selvig because of his knowledge of the issue and aggressive stance, but not so much because of non-A-B money; Schofield shared the broad knowledge, but was far more diplomatic than aggressive on the issue in the campaign. I think this implies some degree of overlap among their supporters. Prediction: Voter turnout 5000 or significantly more (i.e., up to 6000). Reality: 4521 votes, or 10% below (or up to 25% below) my prediction. Judgment: Not bad. I think a lot of people were surprised with the lower-than-expected turnout in an election that everyone thought was high-profile (except at the Boston Globe and Boston Herald). Prediction: Wallingford Road not vote as a bloc, but instead breaking for Glennon at 65-25-10% for Glennon-Ciommo-Schofield. Reality: Wallingford Road not vote as a bloc, but instead breaking for Glennon at 56-26-11. Pretty damn close. Prediction: Elderly vote 60-25-15% for Ciommo-Hanlon-Schofield in Ward 21, Precinct 12. Reality: Elderly vote 27-8-8% for Ciommo-Hanlon-Schofield in Ward 21, Precinct 12, with Glennon carrying 53%. Judgment: Couldn't have been more wrong. Surprise of the night for Glennon. Prediction: Schofield carries the institutional expansion vote, with Glennon and Ciommo way behind tied for 4th place. Reality: Ciommo carried the institutional expansion vote, with Schofield close behind and Glennon in third. Prediction: Glennon won't carry his own precinct [i.e., Schofield takes it]. Reality: Glennon doesn't carry his own precinct -- Ciommo takes it. Reality: Schofield gives Ciommo a run for his money, but Glennon is a strong third. Just counting the two candidates has Ciommo-Schofield at 59-41%, pretty close. Analysis: Schofield campaign best organized, Ciommo a little bit of a hit, Glennon organization in disarray. Reality: On election day, Ciommo's organization got out the vote and Schofield didn't. Glennon organization's performance unclear, since so much of his vote came from blocs partnering with others. Prediction: The race was going to be damn close between Schofield, Ciommo, and Glennon. Reality: The race was quite close, but only between Ciommo and Glennon. Reality: Hanlon 576 votes, Selvig 293. Prediction: The Russian vote determines second place, not first. Reality: The Russian vote determines second place, not first -- but you might instead argue that the split of institutional expansion votes determined second place. Summary: with odds-making like that, bring on the casinos! Here are the unofficial precinct-by-precinct results from Tuesday's preliminary municipal election for the Allston-Brighton District 9 City Council seat. The City of Boston does not publish the unofficial results on their website; the official results will be available next week, and will eventually make it onto their website (possibly after the November election). I've put the results into two tables: the first one has the number of votes per candidate in each precinct; the second has the percentage of vote for each candidate in each precinct. They are preceded by a map of District 9's wards and precincts. Read this accompanying post for an analysis of what these precinct-by-precinct numbers mean. NOTE: at least one person has reported a problem with the formatting, in that some of the right-hand columns appear missing. If you have such a problem, please email me and tell me what operating system (MS Windows, Mac OS X, linux) and browser (IE, firefox, opera, konqueror) you are using. Later today or over the weekend I will post a PDF version and link to it for easier printing. From the Allston-Brighton TAB's coverage of the police and last weekend's parties. Shortly before 2 a.m. on Saturday, police and BC officials broke up a party at 249 Foster St., where they observed between 25 and 30 college students drinking. Police confiscated the tap to a beer keg and gave it to Tom Keady, Boston College’s vice president of governmental and community affairs, for donation to charity. Police warned the nine lessees that further complaints would result in arrest. Police also removed a Boston Police sawhorse from the basement of the apartment. The residents said it had been there when they moved in. I have a feeling that those police won't give the guys at 249 Foster Street a second chance after confiscating that sawhorse. How likely are you to vote in the November 6 election? How often do you vote [on previous City Council races]? Do you think that things in Boston are headed in the right direction, or off on the wrong track? Are you proud to be a Bostonian? In the past five years, have things changed for the better? In the next several years, is your outlook about Boston optimistic or pessimistic? In your neighhborhood specifically, do you feel safe? The mayor will be up for re-election two years from now. But if the election were instead held today, then would you vote to re-elect, definitely consider an alternative, ...? In November, four At-Large City Councilors will be elected. Name who you will vote for (priority order for four): Michael Flaherty, Matthew Geary, Martin Hogan, Stephen Murphy, David Wyatt, Sam Yoon, Felix Arroyo, John Connolly, William Estrada. Which of these attributes, applied to a candidate, would make you more or less likely to vote for him? Do you support or oppose a resort-style casino in Boston? Do you support or oppose moving City Hall to the South Boston waterfront? Do you support or oppose creating term limits for the Mayor? [blah, blah, blah, wordy question...] ...Is access to opportunity the same depending on which neighborhood you live in? Do you have children (under 18) living at home? Anyway, I've got my opinion as to who paid for this survey... I'll hold off on stating my opinion for a few days, though. Now's your chance: who do you think paid for this survey? Choices are: Michael Flaherty, Matthew Geary, Martin Hogan, Stephen Murphy, David Wyatt, Sam Yoon, Felix Arroyo, John Connolly, and William Estrada. Post a Comment [below] giving one name and a reason for your choice! Tim Schofield, third-place finisher in Tuesday's preliminary election for Allston-Brighton District 9 City Councilor, has endorsed first-place finisher Mark Ciommo. 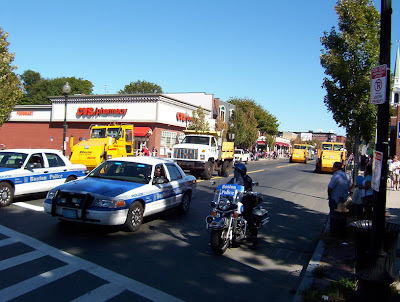 Harry Mattison has posted the full press release on the Allston Brighton Community Blog. This move is not unexpected: Schofield's progressive positions on social issues of the day are likely a closer match to Ciommo than to Greg Glennon, the second-place finisher, although this is not exactly certain. Schofield and Ciommo have both pitched themselves as progressive to the online community BlueMassGroup. The endorsement statement, however, makes no note of social issues; instead, Schofield calls Ciommo the "unifying leader that this community needs." The Boston Globe's news desk broke their silence yesterday, deciding to cover the Allston-Brighton District 9 City Council race with a one paragraph story -- after the preliminary election was over. The Boston Herald has now burst onto the coverage scene with an in-depth, one sentence story a day later. In the municipal preliminary election yesterday for the Allston-Brighton District 9 City Council seat, I received several reports that workers for the Mark Ciommo campaign were at various precincts with their Blackberries. Those reports didn't really describe what they were doing with the Blackberries -- a traditional use or something more clever. I spoke with their campaign today and found out that the PDA Blackberries were part of their get-out-the-vote effort on election day using software written by a company called "First Tuesday in November". I can't find information online about the company, but it is part of the Sage Systems consulting that Ciommo is using to run his campaign. They claim that this is the first time such software has been used on an election day in Massachusetts. The way it works: at some point in the middle of election day, a campaign worker at the precinct polling place inspects the list of who has voted; he then checks off those names on the Blackberry; the information is uploaded in real-time to the computer back at the campaign office; and then a worker at the office immediately knows who among their identified supporters in that precinct hasn't yet voted and needs to be called. The advantage of the PDA approach is not only the speed and efficiency with which the information is recorded into the master database, but also that there is no time-delay in getting the information to the campaign office's phone callers. In other words, they don't waste time calling a supporter who voted during the last hour or so. One person reported to me yesterday that they got called by a campaign two hours after they had actually voted -- they were obviously not called by the Ciommo campaign. This system has some potential working in the other direction, too. The worker carrying the Blackberry can be told where to go to visit somebody's house to help get them to the polls. The technology sure sounds like the way of the future for campaigns all across the country. The Ciommo campaign reported that they were swimming in volunteers on election day, such that they had a little bit of trouble keeping them all busy. I guess the efficiency of computers is not only taking over people's jobs -- it's also taking away the need for so many volunteers on election day. Well, don't get your hopes up too much. It's only one paragraph. As the election results updated this evening, they did not show which precincts were coming in. But it was clear to me by a jump between N=9 and N=16 that Wallingford Road's Ward 21, Precinct 13 was included. Going through the numbers: Wallingford Road split between Ciommo and Glennon, but was leaning to Ciommo. Who did the Wallingford Road votes break to? I just made a simple model guess of 260-260-44 for Wallingford Road's precinct vote, removed those from the overall numbers, then used that 26-precinct overall vote to estimate the vote for six of the seven precincts in the N=9 to 16 jump. Removing those six precincts gives iteration number one for the Wallingford Road vote, fairly close to my initial model guess. So I just iterate through the procedure again, narrowing in on the final answer. Pretty close to convergence with just one iteration. Answer: the precinct went something like 286-221-58 for Ciommo-Glennon-Schofield, i.e., a split vote leaning Ciommo. Based on these numbers, the ward boss, Naakh Visoky, must not have endorsed a candidate. The voters followed their consciences between Ciommo, the director of a senior center who delivers care to them daily, and Glennon, the socially conservative candidate in the race who they know through beloved former State Representative Brian Golden. Without Wallingford Road, Ciommo would have still made the final with Glennon. But if the Wallingford Road had gone as a bloc to Ciommo instead of splitting with Glennon, then Wednesday we might be starting a re-count for second place between Glennon and Schofield. Wallingford Road's Ward 21, Precinct 13 therefore determined second place in this election, not first. OK, OK, OK... I'll wait for the precinct-by-precinct numbers to come in before setting that statement in stone. TAB reporter Rich Cherecwich recently headed to the polls for the evening and has done a survey of (so far) 10 people. The votes break down like this: 3 votes for Alex Selvig; 3 each for Ciommo, Glennon and Hanlon, and 1 for Schofield. Hmmmm. They appear to have counted as well as Enron's accountants. And they posted exit poll results more than an hour before the polls closed -- bad practice. Let me warn anybody against believing these results: the margin of error for a sample of ten -- assuming they were, in fact, counted correctly -- is 32%. All of the candidates have statistically consistent results for their survey, i.e., within the error bars of their tiny survey, it is a dead heat. Rich just talked to five more voters at Jackson Mann — four voted for Schofield and one for Selvig. According to our extremely unscientific poll of 19 people, this puts Schofield and Selvig in the lead with 6 votes total for Schofield and 5 for Selvig. Ciommo and Hanlon each got three of those 19 and Glennon got 2. Amen to the "unscientific poll" statement! The statistical error bar on a sample of 19 is 4.3, therefore Glennon's two votes are statistically indistinguishable from Schofield and Selvig's six each. Still a dead heat. The major papers in town, the Boston Globe and Boston Herald, have not run a single story, as far as I can tell, on the Allston-Brighton District 9 City Council preliminary election or campaign. David Bernstein of the Boston Phoenix searched the archives confirming this. The Globe did publish an editorial endorsing Tim Schofield, but it strikes me as odd that they can enter an endorsement on something that doesn't even warrant a story by their reporters. For the record, the Allston-Brighton TAB has had regular coverage, the Boston Bulletin ran at least one story early on, Bay Windows has covered it, and the Boston Phoenix ran your story a couple of weeks ago on both the At-Large and District 9 City Council races. Adam Gaffin of UniversalHub points out some blogosphere coverage of the election campaigns, including a link back here to Brighton Centered. The Boston Globe managed to outsource its coverage of the September 11th election results to one of the campaigns. It's increasingly obvious that the city papers are outsourcing their coverage of local news to the local papers -- and the blogosphere. What might be next? Outsourcing the coverage to India? Students Living Off-Campus, Local Residents, Landlords & Property Managers. Off-Campus students requested to send at least one representative from each address; attendance will be taken. Boston Police, BCPD, ODSD, Residential Life and more! Voter Information Guide. In case you haven't seen all the Election 2007 related voter information, load the full website of the Brighton Centered Blog and look at the links across the top of the page. Transcripts, audio recordings, questionnaires, interviews, campaign finance reports -- as well as analysis and critical commentary. There is literally no shortage of information about the candidates in this election. League of Women Voters has a thorough guide detailing everything you need to know about voting. There is one candidate, James Jenner, whose name will appear on the ballot but has withdrawn from the race. Where to vote? Just go to "Where Do I Vote (MA)?" Note that a few A-B precincts have changed their poll locations. If you go to a polling place and your name is not on the list of registered voters -- but you believe that your registration may still be current -- then request a provisional ballot. You vote now, and then the elections officials will sort it all out later. When to vote? Polls open 7:00 am -- 8:00 pm. Usually, voters who are in line by 8:00 pm are allowed to vote, no matter how long it takes to process through the queue. Candidate Websites? Mark Ciommo, Greg Glennon, Rosie Hanlon, Tim Schofield, and Alex Selvig. Election Results? Probably at the City of Boston's Current Elections website. How often to vote? Once per registered voter, please. Harry Mattison of the Allston Brighton Community Blog has reiterated his support for Alex Selvig despite the turn of events in the last couple of days. "Will this affect the outcome of tomorrow's election?" Mattison writes. "I doubt it... After all this, I still am supporting Alex." "I apologize publicly for the actions of one of my supporters. The comments expressed were neither sanctioned, shared, nor approved by me or anyone on the Alex Selvig campaign. People who know me know that I would never do this. I deeply regret that damaging postings about the Hanlon and Schofield campaigns were made in a way that implied my participation. I condemn them without reservation. I have run on the principles of openness, transparency and integrity. I stand by those principles. The independent actions of this person have been unfairly damaging to Tim Schofield and Rosie Hanlon, but also to me. I had nothing to do with this, and I am deeply sorry. Being a leader requires me to accept full responsibility, and I do. The buck stops here. I personally admire that Alex has stood up to take responsibility by: confirming that the emails came from a supporter using his house's computer network; apologizing to the two campaigns who were unfairly attacked; and publicly issuing the statement above. We should all commend him for taking these three actions today to address the issue. EDIT (9/24 5:10 pm; and 10/8): Read the statement at the end of this Google Group posting for the identity of the anonymous emailer. The campaign for Allston-Brighton District 9 City Councilor is in the last 48 hours, with the candidates making last-minute phone calls, knocking on doors, attending events, and planning how to get out their voters. I've already received a call from one campaign not only asking me to vote, but reminding me how to find my precinct's polling place. The candidates all showed up to the Allston-Brighton Day Parade Sunday that started in Packard's Corner and ended in Oak Square. Against that backdrop, Alex Selvig's candidacy took a big bump up in the standings this weekend following an endorsement by a prominent activist; unfortunately for him, it may now be followed by a very hard hit over an online smear campaign undertaken by someone with access to his house's computer network. And it is no stretch to think that some of his supporters may become disillusioned, if not outright angry, with his campaign over the rapid turn of events. Mattison has been vocal of his dislike of contributions made to Allston-Brighton campaigns from outside the district. He analyzed Greg Glennon's and Tim Schofield's online campaign finance reports from their 2005 race for State Representative, and showed that only a small fraction of each candidate's total support came from A-B. Rosie Hanlon and Mark Ciommo, on the other hand, are long-time residents whose campaign finance reports from their last race -- for the same District 9 City Council seat in 2002 -- showed that a large fraction of their money comes from A-B contributors. Selvig, however, is a first-time candidate and a self-described long-shot who railed against "rich downtown lawyers, developers" and "lobbyists," thereby attacking "politics-as-usual" as well as "the usual politicians"; he supported taking on the BRA by breaking out its planning functions, but he also diplomatically noted his background in diplomacy. He had few contributors, instead relying on infusing massive amounts of his own money into his campaign -- whether by choice or by limited public support for his candidacy, he told me that he wanted to make it clear that he was beholden to no special interest. While not likely to change the election result by itself, Mattison's endorsement is no small story. Mattison carries enormous respect among the North Allston and North Brighton community as an individual who has consistently: pored over Harvard University's expansion documents with a fine-toothed comb; organized the online community through his blogging, two Google Groups ("AllstonBrighton2006" and "Harvard Neighbors Forum"), and now a website; and spoke out persistently at community meetings to demand that Harvard keep their promises as well as back off on proposals that would doom the neighborhood. Selvig's voter base are people opposed to Boston College's expansion; Mattison provided the keys to the similar crowd opposing Harvard. When asked about Mattison's endorsement, Selvig said that it was "fantastic having somebody who is so [involved] with the [Harvard Allston] Task Force to back me up." He sees it as a sign that "people are really happy with my active work" on institutional expansion issues. "I have great admiration for [Mattison] and his work on the task force." Before Mattison's endorsement, wouldn't the North Allston residents already see in Selvig the candidate with a style that they have been longing for? Many say yes, but a number of activists opposed to institutional expansion on both sides of town have said to me that they don't believe Selvig can win, and have been looking to vote for a candidate who's got a better shot at making the final. That vote of confidence from Mattison is likely to encourage residents on both sides of Allston-Brighton to look again at Selvig as someone who just might have a chance in this election. As I prepared to write those words Sunday morning, however, I saw some emails fly by that may turn Selvig's candidacy upside-down. You'll have to decide. Friday evening and Sunday morning a member of the "AllstonBrighton2006" and "Harvard Neighbors Forum" Google Groups sent out a series of anonymous emails (here, here, and here) under the pseudonym, "BoughtPolitician@gmail.com", that was increasingly inflammatory about two of the candidates in the race. One candidate was said to have "moved here six years ago just to poach a seat. Any seat. State Rep, Councillor [sic], Dog Catcher"; another candidate was described as taking money from "any slumlord, big developer, or bar owner" because the candidate "needed the money, I guess." In short, this was an online smear campaign. The facts underlying those emails from "BoughtPolitician" were based on contributions to those two other candidates' campaigns, as stated in their September 17 campaign finance reports and described both on the Brighton Centered Blog and the Allston Brighton Community Blog. *** In particular, it is true that a member of the legal counsel at the BRA contributed to one candidate's campaign and that a landlord who has been reported on critically by the Boston Globe contributed to another candidate's campaign. The issue at hand, however, was not whether or not the contributions were accepted; instead, it was the smear language being used and the fact that it was done anonymously. I personally replied to the first posting at the Google Group partly out of a desire not to have my writing quoted out of context, but also in order to encourage a person to tone down rhetoric that appeared to be stepping over the line of decency. Since the writer continued the anonymous emails on Sunday, I thought it necessary to get to the bottom of it. I was surprised that the evidence seem to point directly at the home IP address for a candidate for City Council. That IP address was used in no other emails in all my personal files. The IP address match was therefore unique, and likely that of the internet router at Selvig's house (which was later confirmed). Any computer using Selvig's home network could have been used to send the anonymous emails -- so it could have been either Alex Selvig or someone else in his house. Selvig could not be reached for full comment on Sunday, because that day was full of a 5-K race, parade, post-parade party, and street fair. When I finally caught up with him Monday morning, he stated that he did not personally send those anonymous emails, but confirmed that it came from "a very enthusiastic supporter who has access to the network" at his house -- not a member of his campaign -- and that he "didn't know it was happening." He declined to name the person. "This wasn't sanctioned by the Selvig campaign," he continued. "It's not the way we want to do business." He said that he was "willing to accept full responsibility" for the comments. When asked if he agreed with those comments that were posted anonymously, he responded no. "I agree with the gist of it, but not the way it was said... It's something I don't like." Of the person who did the email posting, he concluded, "I guess people are entitled to their own opinions." Will these shenanigans affect the vote on Tuesday? It is hard to tell, because Selvig is already viewed as a long-shot. Selvig's supporters are clearly drawn to him for his willingness to confront the issue institutional expansion aggressively; the hardball politics of his broader candidacy, like these anonymous emails, might be something that goes alongside the hardball activism. His supporters may be disappointed in what has happened, as well as any role that Alex Selvig or his close supporters had in it. One activist, however, is sticking by his man: Harry Mattison, when contacted Monday morning, said that he would eagerly support Selvig even if Selvig were found to be behind the anonymous emails, because Selvig's positions on the issues are what matters to Mattison. As they say in politics, let the voters decide. Tomorrow is preliminary election day in Allston-Brighton. I was personally extremely worried that leveling allegations about one of the candidates for City Council one day before the preliminary election would be contrary to journalism standards, and possibly not consistent with serving the public interest. Readers of this blog should be assured that I consulted with two professional and highly-respected journalists prior to my decision to run this story. *** Note that I have reported here on the contribution of James Tierney, Senior Counsel for the BRA Director, to the Tim Schofield campaign. His campaign manager was offered the opportunity to comment and provided an explanation of Schofield and Tierney's long personal ties. The initial reporting at the Allston Brighton Community Blog about the other campaign contributions did not offer any of those candidates the opportunity to respond. Mattison has since requested comment from the candidates related to those postings, and edited the posts accordingly, so readers are encouraged to re-read the recent posts on that blog related to campaign finance. 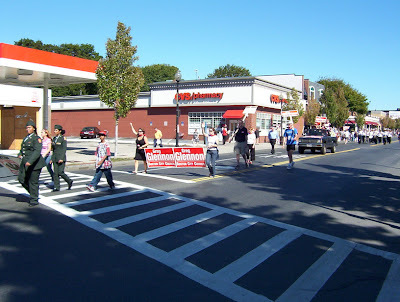 The Allston-Brighton Day Parade took place on Sunday, September 23 following the Brian Honan 5-K Race and Walk. I missed out running the race due to a sore ankle, but watched it and the parade in their entirety. 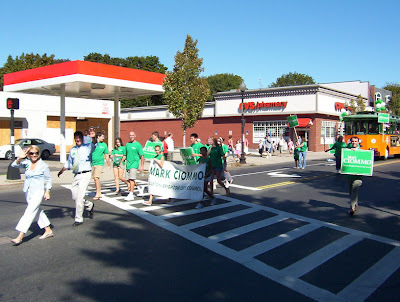 The events this year were part of the Brighton-Allston Bicentennial Celebration, which meant that there were far more entries in the parade, particularly marching bands. 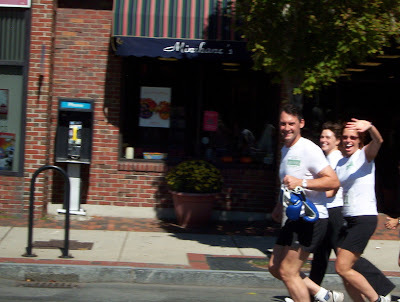 I didn't see Representative Kevin Honan running or walking, which I believe he did last year. Hope nothing's wrong. Oddest thing? 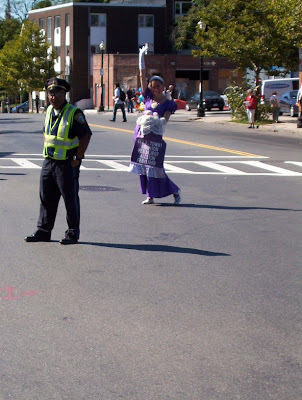 The parade was led by Mayor Menino. No, that's not weird. But he was alongside Westwood resident and former A-B District City Councilor Jerry McDermott. It has been a long time since anyone I know has seen McDermott around these parts. Welcome back to town! OK, one more thing that was really odd: campaign literature handed out for Joe Jaworski, candidate for the Texas State Senate District 11. We've got enough candidates here already, take him away! Note to Tim: bring along a big-@$$ car for the next parade! Boston College Vice President Thomas Keady, Jr., found his next calling in life as a groupie trailing alongside the BC Marching Band. I'm not sure how much sleep he got after his midnight-3am shift in the BC Police patrol car last night. At-Large City Councilor Stephen Murphy didn't shake my hand. Again. Sure, I look like a bearded hippy with questionable personal cleanliness -- but I really did shower an hour or two earlier. Prime Realty won the "Best Favor Award" again this year with their frisbee in a goodies bag. (EDIT 9/24 8:00 pm): I can't believe I forgot about Rosie Hanlon's hand towels! They were throwing us the the towels -- not to be confused with her throwing in the towel. I am changing this to a tie for the award. Note to the Councilor: there are no cars parked on this street because they got towed. It's kinda hard to have a parade with all those cars parked all over the place. At about 3:30am, on Sunday, September 23, 2007, officers from Area D-14 (Brighton) responded to a radio call for a fight at 15 Pratt Street. On arrival, officers observed a small group gathered in the middle of the street. Officers spoke to the victim who stated that an individual, after being dared, jumped into the seat of a steamroller, started it up and, then, drove it into his car. Officers observed minor damage to the bumper of the victim’s car. When speaking to the suspect, officers observed that it appeared the suspect was under the influence of alcohol. Officers arrested Matthew Gilman, 22, of Allston and charged him with the Destruction of Personal Property and Larceny of a Motor Vehicle. You can say the vehicle was pressed into service. The police officers got the ball rolling by taking him down to the station. In a guest column Mark D. Trachtenberg wrote for Brighton Centered recently, he speculated that James Jenner might have been promised a job by Rosie Hanlon in exchange for him withdrawing from the race and throwing his support over to her. I tried unsuccessfully to contact her for comment at the time, but we are both in the middle of a crunch time leading up to the election and she could only get back to me this afternoon. She denied his speculation completely, saying that there is no agreement with Jenner. "My values are on the same line as his," she said. "He gave it his very best, and I loved what he did" in running so well as a first-time candidate. All he asked her was, "Would you mind if I supported you?" And Hanlon accepted his offer. And so the non-story is put to bed. I haven't dug around to figure out the labor endorsement situation for the Allston-Brighton District 9 City Council race because, frankly, I just can't keep track of all the different unions and then call them all up to find out who, if anyone, they endorse. The Allston-Brighton TAB has listed labor union endorsements and Harry Mattison has listed campaign finance contributions by labor unions; these are not exactly the same things, although they usually track each other fairly well. Note that the union endorsements are self-reported by the campaigns; nonetheless, I can't imagine a campaign mis-representing a union endorsement, because they would be run out of town with no political future. Four generations of Ciommo’s family have been involved in the labor movement. His great-grandfather organized Local 39 Curbsetter and Pavers in the early 1920’s which was recently merged into Local 151 Laborers. Ciommo continued his family’s proud involvement in union organizing. In the early 1990’s he actively assisted the Boston Community Center staff to unionize. I asked Mark several months ago about his large number of labor union endorsements, and he said it was the result of his long-standing and close personal ties to the people in those groups. It was obvious from the nature of his remarks that he was demonstrating how he won those endorsements himself, the old-fashioned way -- rather than having a higher power help him out. Tim Schofield won only one union endorsement (not noted by the TAB), but it is a plum: the Boston Teachers Union. Rosie Hanlon informed me that she has very recently received the endorsement of the Teamsters Local #25. It is interesting to compare this list of union endorsements to the campaign finance reports, to see which of these unions backed up their endorsements with a contribution. Schofield's BTU endorsement netted the maximum $500. Ciommo got $500 each from Iron Workers, Carmen's Union, and Pipefitters, $250 each from Carpenters and Painters/Allied Trades, $200 from Sheetmetal Workers, $150 from Operating Engineers, and $100 from the Boston School Custodians. Adding them up, Ciommo received $2200 from unions, or 9% of his overall campaign contributions of $24,592. As of September 14, Ciommo had received no contributions from United Food and Commercial Workers, AFSCME Corrections Officers, or IBEW Electrical Workers. I can only assume they'll correct that admission in time for the next filing deadline. 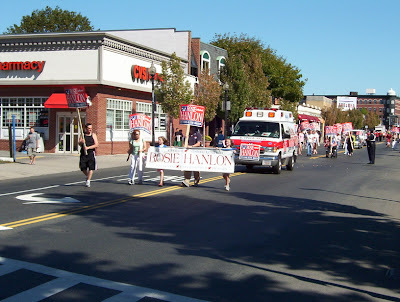 Hanlon has not received a contribution from the Teamsters (because their endorsement occurred after the September 7th closing date for the finance report), but she did receive contributions (but not endorsements) from the Sheetmetal Workers Union for $200 and the Sprinkler Fitters #550 for $300. Note that it appears as though the Sheetmetal Workers are supporting two candidates (Ciommo and Hanlon) and endorsing neither (at the moment) -- this is not exactly clear, however, because the two candidates list different contributor names and contacts for these two contributions (Festus Joyce of Sandwich for Hanlon, and Neal Kelleher of Dorchester for Ciommo), so they may be different local groups of the same larger union. Tim's report solves the mystery of "who is Menino with" - he has all of Menino's contributors = Billy Ferullo; McDermott, Quilty and Miller; Joe Hanley; Howard [Leibowitz] - those are key Menino supporters while no other candidate has them. Check it out! Two knowledgeable insiders of Allston-Brighton politics flatly state that Mayor Menino has neither endorsed any candidate nor is making any serious effort to pull strings behind the scenes. They both point to the labor union endorsements: if Menino had chosen to back a particular candidate, there would be lots of additional union endorsements, including one particular union (I'll leave it unnamed) that would tip his hand. Enough said for now, but we'll no doubt re-visit this issue between the preliminary and general election. *** Note that the "Political Notebook" in the Allston-Brighton TAB prints information "submitted by area politicians and others." The TAB's disclaimer does not appear in the online version of the paper, but does appear in the print version.